Online reviews provide consumers with the confirmation and reassurance that they are making wise and informed decisions when it comes to buying a product or engaging the services of a company. Imagine, as a small business you’re looking to engage the services of a digital marketing company. In your city, the market is awash with different companies, all offering the same services. Although price will certainly be a key factor in your decision-making process, as will the likelihood of finding the company on page one in the search engine results pages (SERPs), you’re also likely to turn to the Google Reviews to evaluate the quality and trustworthiness of the company you are looking to engage. Finding a company that has good review ratings might be all the confirmation you need to ultimately go ahead and pick up that phone. But there are so many other fantastic SEO benefits to getting good reviews and in this guide, I want to take a look at some of them. Visibility in search engine results pages for local businesses is crucial. Although Google isn’t exactly forthcoming with details as to how its algorithm operates, it is widely accepted in the SEO community that reviews play a significant role in how websites rank within the SERPs, particularly with local search. Even just taking a few seconds to search for restaurants in a particular location will quickly reveal that the top positions in organic search will be occupied by those that have accrued a good number of positive reviews. This is, in part, because search engines recognise the value of online reviews and understand that users want easy and efficient access to the best local businesses. 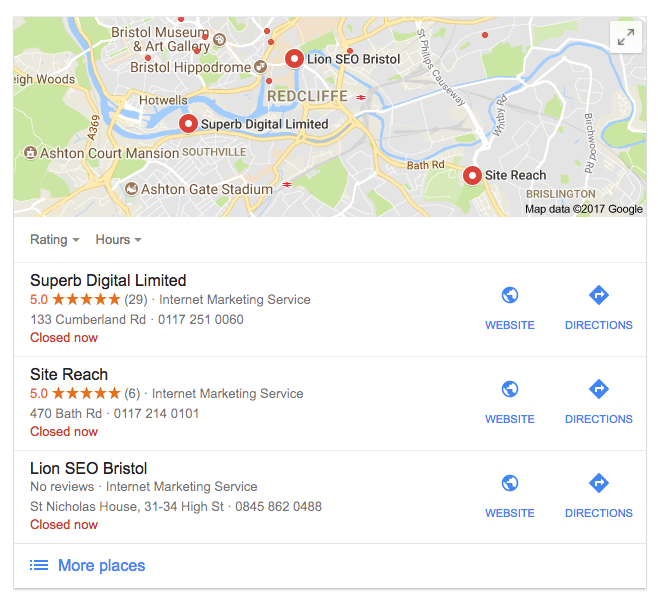 Maintaining and optimising your Google My Business listing is becoming more important than ever, as the marketplace becomes more competitive. As well as ensuring your contact information and opening times are accurate, asking or encouraging your customers to leave Google Reviews will help to boost your organic rankings as well as have a significant impact on click-through rate. Put yourself in the position of a consumer searching for local businesses within your niche who has found 3 results. 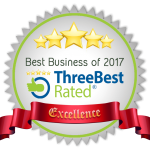 The first has an average review rating of 3.2 with 325 reviews, the second has an average rating of 3.0 with 125 reviews, and the third (your business) has an average rating of 4.0 with 412 reviews. Your business immediately looks like the best and most reliable option. Although not as powerful as Google reviews, other review platforms will together create important signals that Google will use to determine the value and relevance of your business when curating its results pages. 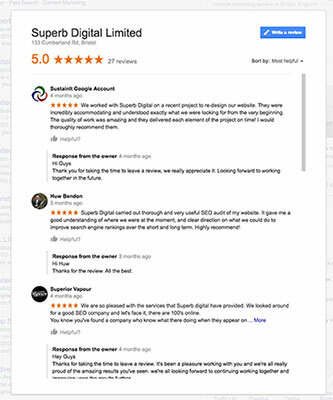 Achieving similarly positive reviews across other sites will positively reinforce the way Google sees your business. This is because it demonstrates that your business hasn’t just been aggressively targeting Google reviews to boost your standing and that the reviews you have gained are more likely to be natural as they appear across a number of other sites and platforms. A 2011 Harvard Business School study looking at restaurant businesses found that a one-star review increase had the potential to increase revenue by between 5% and 9%. The more positive reviews your business achieves, the more traffic your website is likely to attract because increasing numbers of consumers, already receptive to your message, will want to learn more about what you can offer them. If your content provides them with valuable information and your calls to action encourage additional engagement, this can have a hugely positive impact on your ROI through increased sales and conversions. Although you could sit back and wait for your customers to leave reviews, being proactive and managing your online reputation will be much more beneficial. It has been said that is that a customer will always feel more inclined to leave a negative review following a poor experience than they would following a good service. That being said, if you can provide an absolutely top class experience that goes above and beyond their expectations, they are more likely to leave a review than if you were just to provide a satisfactory service. In other words, be the best at what you do and great reviews will follow. You might be surprised at just how willing your customers will be to leave a review if you ask politely and communicate how important it is for your business and don’t be afraid to show them how to leave a Google review, not everyone is tech-savvy enough to know. If you feel that it’s not appropriate to ask them verbally, consider printing a small request on receipts, business cards or leaflets. It’s important never to offer to compensate customers or clients in any way for leaving positive reviews though, as this goes against Google’s Webmaster Guidelines and can see your site severely penalised. This includes non-monetary offers like offering to leave positive reviews in return. Incorporating review requests into your email and social media strategies can be extremely fruitful; just avoid inundating your audience with this type of communication. If you are conducting email marketing then make sure you put a footer at the bottom of your email asking people for reviews and leaving a link so they can do so. Try A/B testing different text to see what works best. Consumers see online reviews in almost every online search they conduct. Although securing online reviews is a gradual process, it is one of the simplest and most cost-effective methods to rank well in key search results pages, and build trust with your audience.